Nothing could be more fitting than a show on September 11 in New York City, wrapped around Depeche Mode‘s 14th studio album Spirit. 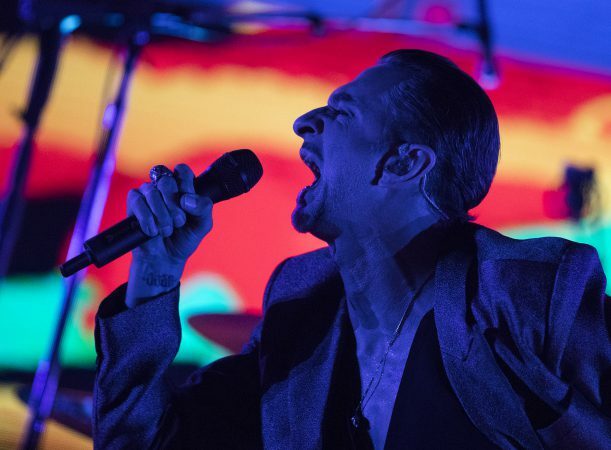 Partly fueled with political angst, it might be hard for some to think the world is in a better place 16 years later, but Spirit isn’t Depeche Mode sending negative vibes out to the world. As with anything the band has done in their nearly 40-year career, there’s always some darkness, and a light. More empowering, Spirit attests to strength, perseverance, longevity, love—and all came across on stage Monday night at Madison Square Garden. Flashy visuals oozed sexiness for “In Your Room” from 1993’s Songs of Faith and Devotion, and even a voyage into space in the band’s latest video “Cover Me,” (also directed by Corbijn). Pop art filtered pigs, rabbits, dogs and other creatures commanded the screen during “Enjoy the Silence” before a brief respite, an acoustic version of “Judas” with Gore on vocals.